Majorca’s home of hedonism, El Arenal is the island’s party central—a high-octane resort that offers the best in Balearic indulgence by night and white sand beaches to soak up the sun on by day. If you like your clubbing with a dash of cosmopolitan style, El Arenal delivers in spades. This sun-kissed pleasure seeker’s paradise is a mecca for hard partying holidaymakers from all across Europe. It’s the resort’s international flavour that gives it its unique character—loud, raucous and fun, but with a touch more class than most. Think chic rather than flashy, bold rather than brash. Heavy nights give way to lazy days as partygoers emerge from the El Arenal hotels to recover along the six kilometres of heavenly beaches. Their soft white sands and tranquil blue seas soothe heads and revitalise tired feet. World-class nightlife, award-winning beaches: El Arenal is a clubber’s dream destination. 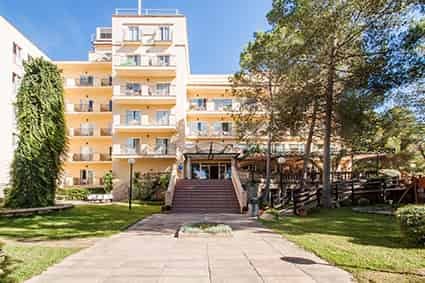 Just a few minutes from the international airport at Palma, this lively, friendly resort is ready with a warm welcome. You can jump in with both feet at one of the endless stream of bars and clubs or ease yourself in gently and explore the area while you get up to speed. El Arenal sits at one end of a long stretch of pristine beach, with its neighbouring resorts of Playa de Palma and Can Pastilla joining it along the coastline, linked together by an unbroken expanse of wide pedestrian promenade. It’s a great place to stroll and take it all in, or you can even climb aboard the mini train that ferries visitors between spots. Drop into a few of the shops along the walkway and snap up a bargain or fortify yourself in one of the many restaurants as you prepare for the night ahead. If you can’t resist the beach, you’ll find the immaculately clean, Blue Flag-winning sands are well stocked with everything a sun worshipper needs. There are plenty of loungers to unwind on as you top up the tan, and a huge range of water sports on offer, including windsurfing and Scuba diving. As the sun goes down, the revellers appear, ready to dance till dawn. Whatever your taste in nightlife, from intimate jazz bars to mega clubs crammed with thousands of party people, El Arenal has it all. Getting to El Arenal couldn’t be easier, with Palma International airport sitting right on its doorstep. Transfer times to the resort are around 15 minutes and there are a number of taxi and shuttle services that will whisk you to your El Arenal hotel in comfort. El Arenal sits at the eastern end of this six-kilometre stretch of impeccably-white sand, which shelves gently into the warm Mediterranean. Proudly flying its Blue Flag for cleanliness and safety, the beach extends all the way along the coast to Can Pastilla, backed by a continuous palm-fringed promenade. Among the many great features of this popular beach are the Balnearios, small huts containing showers and toilets that run along its entire length. This tiny span of golden sand is a favourite with the locals but goes largely unnoticed by visiting tourists. Lying just in front of Palma cathedral on the edge of the city, it’s a short drive along the coast from El Arenal. Measuring 750 metres in length and only 15-metres wide, it can get busy during the hot summer months, but the soft sand and clear waters make it well worth the trip. 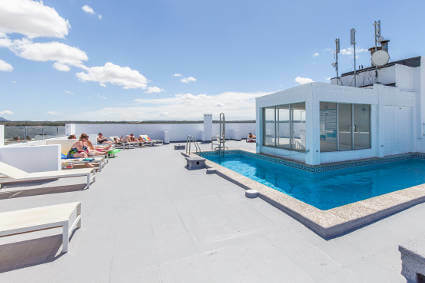 You can treat yourself to a decadent cocktail or two on the Nassau Beach Club’s roof terrace after a long day’s tanning. September marks the start of the artistic season on Majorca, kicked off by the Nit de l’Art in Palma, when museums and galleries throughout the city host brand new exhibitions on the same day. The thriving contemporary art scene on the island mean thousands flock to the streets to discover a new favourite artist or just to catch one of the impromptu performances that spring up in the streets. You don’t have to be a connoisseur to appreciate the creative vibe, and it’s an event not to be missed. Found just a stroll from the centre of El Arenal, Palma Aquarium makes for a brilliant day out. The aquarium is open 365 days a year, from 9.30am to 6.30pm. It’s a great size, and focuses its efforts on sustainability and the animals’ welfare. There’s a touch pool where little ones can stroke starfish and look at corals, while the tropical pool is a hub of colour and movement. Big Blue is 9 metres deep and houses sharks galore. There’s an electric jellyfish tank, and the jungle is a rainforest-like haven. It even has it’s own waterfall...and piranhas! The largest water park in Majorca, Aqualand is packed with white-knuckle rides designed to test your nerves and rejuvenating swimming pools to help you get your breath back. Here you can take on the G-forces of the Anaconda or dive into the unknown in The Black Hole. For the ultimate relaxation, you can take a lazy inner tube ride down the tranquil Congo River. It’s a great place for families as well, with plenty for the kids to explore in Polynesia World and Dragonland. 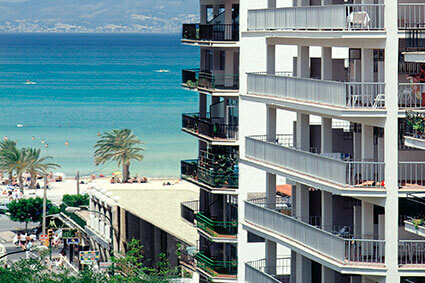 The capital city of Majorca, Palma is just a 20-minute drive from El Arenal. Known as the ‘pearl of the Mediterranean’ this cultural hotspot is teeming with history and packed with beautiful architecture. On top of that, it’s the ideal spot for a dose of retail therapy, with many of the world’s top luxury brands having stores and boutiques here. Also home to a wide range of festivals and art events throughout the year, Palma offers a fascinating city break destination.